It was hours after my daughter’s premature birth. My in-laws swooped in the next morning, having traveled several hours to see their new preemie granddaughter. In hand, my mother in-law brought a set of preemie girl clothes. I was still trying to grapple with my daughter being here already, how to use a breast pump (not a pro at first, I assure you) and sort out recovery from a rather rough and tumble childbirth. Yet my daughter’s fashion needs were already figured out. My mother-in-law loved going “pink shopping” you see. And of course my daughter made the smart decision to surprise us with an early birth that just happened to coincide with Grandparents Day. She wanted to get in good with the future grandparents of course, right? 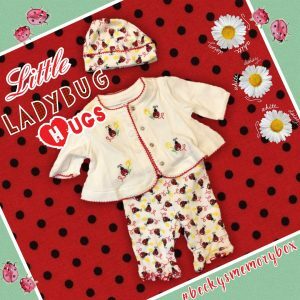 One of the outfits we received was the “ladybug outfit” that I adored. Whenever I provide Powerpoint slides for speeches, etc. I often include this picture of her in the outfit. It is one of the first outfits she wore at home. Did you have a go-to or favorite preemie outfit? A favorite? Tell us!